Steering is one of the most important components of your vessel because it’s responsible for maneuverability and smooth sailing. Make sure your boat performs to the best of its ability by scheduling an appointment today! 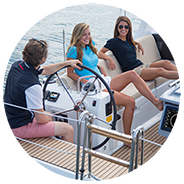 Our technicians are available for both inboard and outboard installations and repairs. To dispatch a highly trained and dedicated technician to your vessel’s berth on time and ready to take on any task. We are experts in steering systems and have state-of-the-art tools that will allow us to take on any job.